Obesity – How'd THAT Happen? Photo by Drew Hyland Whole fruits are healthy carbs containing fiber. 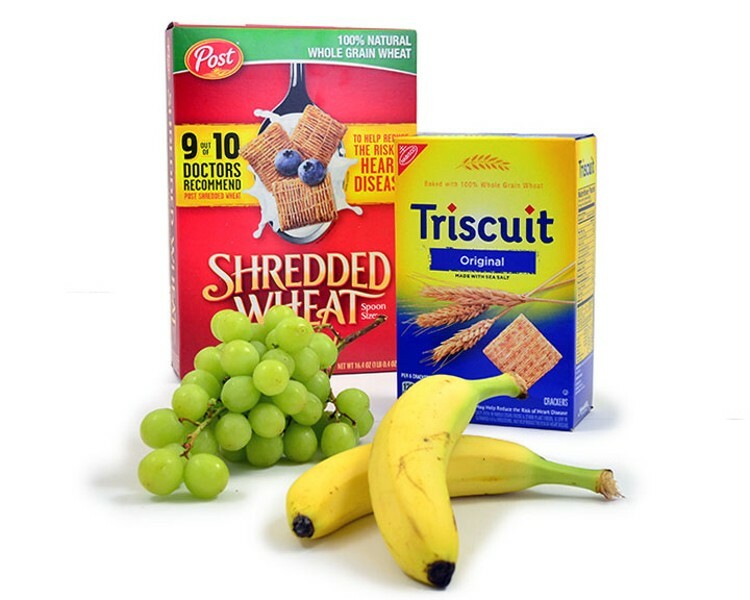 For crackers, breads and cereals, look for 3 grams of fiber per serving and low/no sugar. 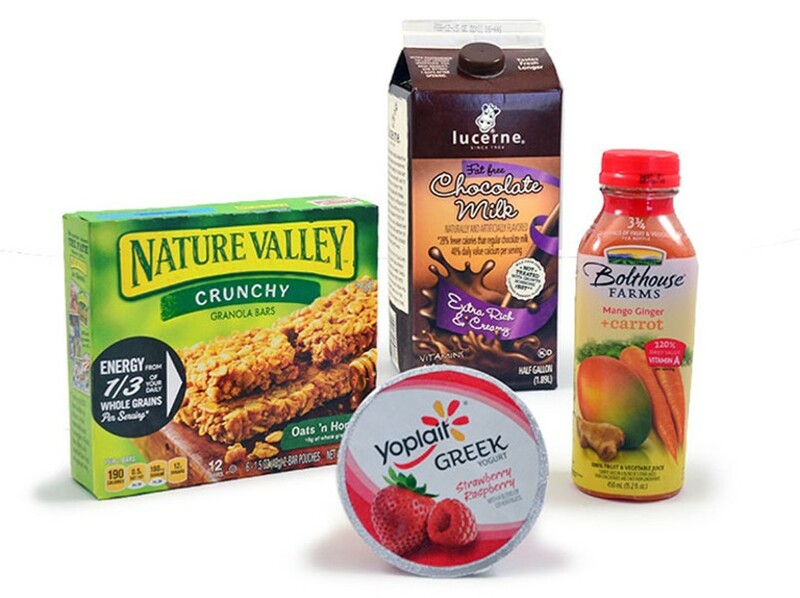 Photo by Drew Hyland Treats with high sugar content: granola bars, 12 grams per serving; nonfat chocolate milk, 26 grams per serving; juice, 23 grams per serving; sweetened yogurt, 18 grams per serving. Four grams of sugar equals one teaspoon. Low Fat Makes You Fat. Bad Cholesterol — a Myth. Peanuts Cut Diabetes Risk, Hunger. It turns out magazine headlines like these are all true. But in case you don't trust the reading material at the supermarket, how about the New York Times March 17, 2014: "Study Questions Fat and Heart Disease Link." The article did a lot more than "question." It stated there is no scientific evidence linking dietary fat — meat, butter and eggs — to heart disease. None. Fat Chance is my favorite book on the topic, though it's not particularly well written. Author Robert Lustig, an endocrinologist from University of California San Francisco who treats obese children and families, is fond of clichés. And — fair warning — it's a bit of a slog to get through the science: anorexigenic vs orexigenic, everything you've ever wanted to know about leptin, insulin, ghrelin, cortisol ... and who knew we all had a vagus nerve? I also remember how shocking it was in 1955 when our physically fit, ex-military President Eisenhower had a heart attack — so young! That same era, epidemiologist Ancel Keys, inventor of World War II K-rations, turned his post-war scientific brain to heart disease. He noticed high cholesterol levels in patients with heart disease, and high cholesterol levels in diets. To further his research, he spent 1952 in England studying the bad heart health of some Englishmen whose diets consisted of bangers and mash, and fish and chips. He became absolutely convinced dietary fat was the culprit. By the late 1960s, as a nation, we were under orders to reduce fat consumption from 40 percent of our diets to 30 percent. And boy, we did it. Only the result was one Keys never could have predicted: Obesity, and all related metabolic disorders, began to skyrocket in the 1970s — and that rocket's still rising. We even invented a few new diseases, like type II diabetes in children and babies. Lustig has a lot of pretty blunt things to say that you may not want to hear: Sugar is a lot more than a sweet treat. It's a toxin — all 40 or more kinds of it, including honey and fruit juice. Sugar, specifically fructose, has to be processed by the liver — unlike, say, mashed potatoes, another carb that the gastrointestinal tract takes care of rather nicely. Excess sugar is stored as fat. And did you know there are two kinds of the "bad" LDL cholesterol? One, relatively harmless, comes from dietary fat. But the other LDL type — the tiny, dark, sticky blobs produced from sugar — is deadly. Lustig also does a good job explaining that calories in do not equal calories out. So why are we so obsessed with calories? (There goes the First Law of Thermodynamics, right out the window, on page 11 of Lustig's book.) Diet and exercise do not work to cure obesity. Military boot camp, expensive spas and the Biggest Loser are all controlled environments and in the short-term will result in temporary weight loss, defined as less than two years. So what are we to do about this crippling and expensive obesity epidemic other than not gain weight in the first place? But what about kids, parents — entire families — who are truly obese and at risk for all those metabolic disorders from which we suffer? Lustig has only a handful of rules for his patients and families. No dieting. (No food rationing. Food is not your enemy. Mealtimes should be happy times anyway.) Drink water or milk — no juice or soda. Wait 20 minutes before second helpings. Get fiber back into your diet ASAP. (Fiber is magic. Chapter 12 explains why it's half the answer to the obesity epidemic.) Lustig's final command is for kids to trade one hour outside for every hour of screen time — the hardest rule to keep, according to his patients. PS: I am a fan of exercise. I love endorphins any way I can get them. But people erroneously think if they exercise enough, they will lose weight. That's a fantasy (Chapter 17). Editor's note: Journal co-owner/publisher Judy Hodgson has been retired from day-to-day operations at the Journal since early 2014 and has more time to pursue topics that interest her personally. If you are interested in learning more about Lustig's work, contact Hodgson directly at judy@northcoastjournal.com. She has some extra copies of the book to share. In November, the University of California at San Francisco launched a new website called "The Sugar Science Initiative" (www.sugarscience.org). It's designed to act as a clearinghouse for scientific evidence against sweetened foods and to disseminate that information to the public. Dr. Peter Lustig is one of 11 researchers across the nation who contribute to the website. He says, "People still think it's just about calories," and his mantra is, "Calories in do not equal calories out." "The science is not yet clear on whether artificial sweeteners are better or worse than regular sugar. There is, however, emerging evidence that raises concerns. Artificial sweeteners can sometimes help people wean themselves off sugar. One question we've been concerned with for years involves the counterintuitive finding that consumption of artificial sweeteners is a predictor of overweight/obesity. New evidence published this year in the prestigious science journal Nature suggests one possible answer. In a series of studies in animals and humans the researchers found that a wide range of popular artificial sweeteners damage beneficial bacteria in the human digestive tract. This, they found, is linked to insulin resistance — a metabolic disturbance that occurs in people who consume too much added sugar. We will be watching this research carefully and will update SugarScience.org as more studies on this topic are published." When we have younger grandkids visit for a week or more — without parents, so we can brainwash them — I post "Grandma Rules." It's not grim at all. We have a lot of fun cooking together (lasagna, awesome split pea soup) and eating. Do we consume treats on those visits? You bet! And I'm not giving up my evening wine while they're having ice cream or chocolate milk. If kids are hungry, and they always are, they eat free-range from lists 1 and 2. Younger kids should "ask" for a treat and know when they are consuming one. Older kids should already know and decide for themselves. The three lists below are adapted from Fat Chance, by Robert Lustig. 3. Treats when your mom or dad says OK. Ask first! Practice: When reading labels, don't worry so much about calories or fat. (Some fat is good for you.) Try to find how many grams of sugar are hiding in there. Every four grams is a whole teaspoon of sugar. Seriously.